The Holidays are near! For us Greeks, this means that some of our favourite festive sweets and desserts will become widely available: Melomakarona, Diples and Kourabiedes. Our personal favorites are the Melomakarona (pronounced mel-low-ma-KA-row-na); melomakarona are honey-orange-clove-cinnamon syrup-drenched soft cookies that melt in your mouth. They're THE most popular Christmas & New Year treat, and you can find them in every home here in Greece during the Holiday season. Many families still follow the tradition of making their own melomakarona, at home. They're quite easy to make, plus this way you can make them just the way you prefer, adjusting the ingredients. If you don't feel like baking though, you can also find melomakarona in every pastry shop/bakery in Greece, during the Holidays period. Being so popular, melomokarona (as also happens with many other Greek recipes), have many variations. All of them however, include honey, cinnamon and cloves as the main ingredients which determine their flavor. There are modernized versions of the recipe, which contain butter or eggs. There are versions with lemon juice/zest instead of orange (which is the most common fruit used), there are versions made without olive oil, other versions with caster sugar, others with baking powder, brandy etc. The list goes on and on. In this post we will share our own family's version for the recipe, which a more traditional one. It doesn't contain any eggs or butter. Melomakarona is supposed to be a dessert that’s suitable for those following the Orthodox Christian fasting, which doesn't allow the consumption of any dairy/animal products. So, this is a recipe that is great for vegetarians, as well! Now, picture this; your home is decorated for the Holidays; Perhaps some festive music is playing in the background. You are shaping the melomakarona from olive oil scented dough -if you have kids it's a perfect way to introduce them to the kitchen AND create some beautiful memories at the same time- and your house is already filled with the aroma of the cinnamon, the cloves, the orange and the honey from the syrup; beautiful, healthy ingredients are all around your kitchen counter. Can you resist? What are the melomakarona made of? The dough is made with vegetable oil (a part of it MUST be olive oil to enhance the taste), flour, semolina, orange juice (AND zest), baking soda, ground cinnamon and clove. As simple as that! The syrup is made with orange juice, some zest, water, sugar, cinnamon sticks, and whole cloves. The aroma is trully amazing. The only thing you should take into account when making melomakarona is this: if the syrup is hot, then you must throw the cookies in it, in room temperature in order to soak it up properly. Most of the people (us included) do it the other way around; First we prepare the syrup, then let it chill (close to a window or outside to help speed up the process), and then start making the cookies. As soon as we take them out of the oven we throw them in the cold syrup for a few seconds to soak. You can also make the syrup ahead, the day before, to make things easier. 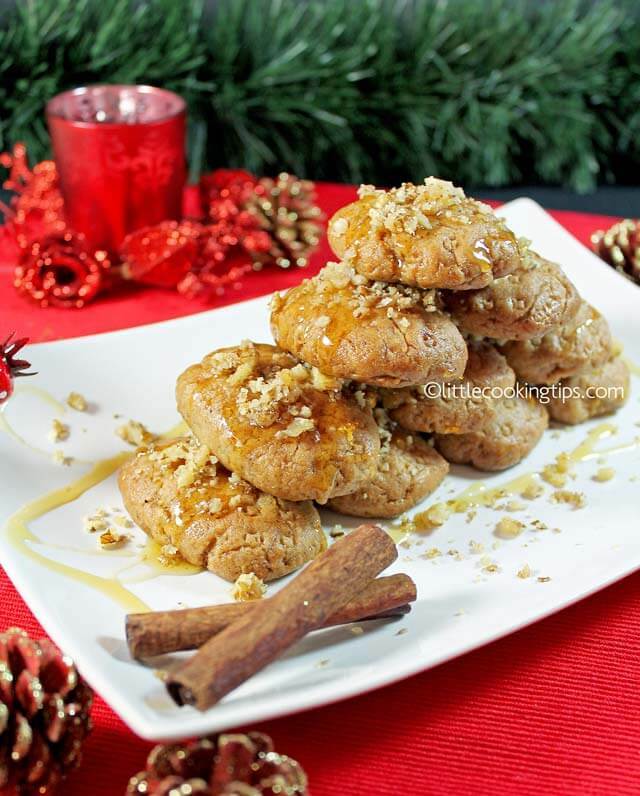 The final touch in melomakarona, is drizzling them with juuuust a little more honey (use a small fork dipped in honey to achieve that) and sprinkling a few ground walnuts on top of each layer of cookies. Oh yes, there are layers! Most people put the melomakarona on top of each other forming a small pyramid/cone and finally cover them with some cling film. The form of the stacked cookies is reminiscent of the tip of a Christmas tree. So let's see how to make them! It’s better to start with the preparation of the syrup, int order to allow it to cool, while you make and bake the dough for the cookies. Better off, prepare the syrup the night before. Place in a saucepan: the water, the sugar, the orange zest, the orange juice, the cinnamon sticks and the cloves and put it on medium high heat (pic. 1). When it starts simmering (pic. 2), remove from heat and add the honey (pic. 3). Whisk until it dissolves. Leave the saucepan next to an open window, or outside, to cool down. It's important that the syrup is cool when you place the cookies in it, later on. If there's no much cold outside, in order to allow it to cool down relatively quickly, prepare the syrup a day before; once in room temperature, place it in the fridge. Place the ingredients for the dough in a large bowl, following the order given from the ingredients list. (see pictures below: sunflower oil, olive oil, orange juice, baking soda, clove). Whisk well when you add the baking soda (pic. 4), for about a minute, to allow it to blend with the orange juice (pic. 5). When you have added all the ingredients except the flour (cinnamon, sugar, zest, semolina pic. 7-10) , remove the whisk and then add the flour on top (pic. 11). Mix gently with your hands, by “folding” the dough from the bottom to the top. No rush here. This way all the ingredients will blend perfectly, creating a soft dough (like that in pic.12). This kneading process should not take more than 2 minutes. The more you knead the less fluffy the dough gets. Line a baking sheet/pan with parchment paper. Shape small oval cookies with your hands, in the size of your palm. (pic.13). Place the cookies on the lined baking sheet, with a small distance between them (pic.15). The dough is enough for about 3 batches of cookies. Once the first batch is prepared, put the baking sheet/pan in the middle rack of the oven (there should be 4 lines with about 6 cookies per line / around 24 cookies per batch). Once you remove the cookies from the oven, immediately dip them (using a slotted spoon) into the syrup for about 20-30 seconds to soak (pic.16). You can dip up to 6 cookies at the same time. You have to be a little careful with the cookies though, because they are oven hot. Then place them on a wire rack to drain, for a few minutes (pic.17). Once drained, place them in a large plate. Drizzle with a bit more honey, using a small fork (pic.18) and add some crushed walnuts ( pic. 19, optional). Continue the exact same process with the next batch of cookies, until they are all baked, dipped into the syrup and drained. Always remember, the cookies must be placed in the syrup right after the come out of the oven (hot cookies in cold syrup). Enjoy! While the first batch of cookies is baking, you can start making the next one, shaping the dough into cookies and placing them on a second lined baking sheet/pan. This way you save a lot of time.